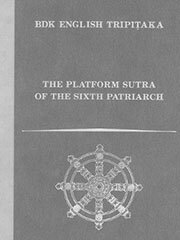 The Platform Sutra (more fully, the Platform Sutra of the Sixth Patriarch) is a Buddhist scripture that was composed in China. It is one of the seminal texts in the Chan/Zen schools. Centered on the discourse given at Shao Zhou temple attributed to the sixth and last Ch’an patriarch, Huineng. Some modern scholars seriously doubt the historicity of the claim that someone named Huineng wrote the text, but this does nothing to diminish the fact of its widespread influence. The key topics of the discourse are sudden enlightenment, the direct perception of one’s true nature, and the unity in essence of śīla, dhyāna and prajñā. The Southern Chan or «Sudden Enlightenment» school of Chan Buddhism based its doctrine on this extremely influential scripture. The Chinese title is :六祖壇經 or Liúzŭ Tánjīng (T 2008.48.346a-362b). The earliest extant version of the Platform Sutra, the Tun-Huang text, was translated into English by Philip Yampolsky.